Delicious made with brown rice or a mixture of brown, white and wild rice. Melt the butter in a large frying pan, add the turmeric, cumin, coriander and onion and cook for 5 minutes or until the onion is soft. Add the red pepper, carrot, celery and courgette and cook for 5 minutes longer. Remove the pan from the heat, add the cooked rice and eggs and mix to combine. 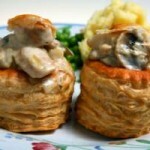 Divide the pastry into two equal portions and roll out each portion to a 10 inch (25 cm) square. Use a 9 inch (23 cm) dinner plate or cake tin as a guide and cut out two circles. Place a circle on a baking tray lined with non-stick baking paper. Top with the filling, spreading out evenly with a fork and leaving a 1 inch (2.5 cm) border. 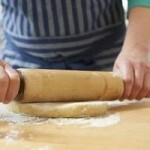 Moisten the border with the egg mixture and top with the remaining pastry circle. Pressed edges together firmly to seal. Knock back the edges using your finger and knife to make a decorative scalloped edge. Pierce the top of the pie several times with a fork, brush with the remaining egg mixture and sprinkle with sesame seeds. Bake in a pre-heated oven at Gas Mark 7, 200°C/425°F for 15 to 20 minutes until the pastry is crisp and golden. 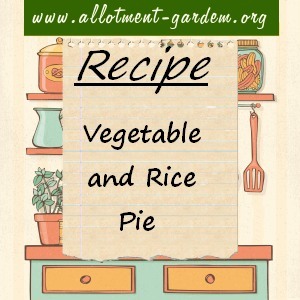 Any leftover cooked veggies that you have in the fridge can be used in this pie. To ring the changes, try using fresh or dried mixed herbs in place of the spices.